1. the position or function of a leader, a person who guides or directs a group: He managed to maintain his leadership of the party despite heavy opposition. Good leaders are made not born. If you have the desire and willpower, you can become an effective leader. Good leaders develop through a never ending process of self-study, education, training, and experience (Jago, 1982). President Barack Obama has proved to be one of the worst leaders that America has had the sad experience to witness in quite some time. Every time there is a negative issue that he faces, his answer is not to provide solutions, his answer is to blame George W. Bush. How often have we heard that the economy is all Bush’s fault? Granted, in some cases Obama is correct; however, what purpose does that serve? Three plus years in Obama’s first term and he and his minions are still blaming Bush for anything that is perceived to be a negative. Add the GSA excessive spending scandal top the latest debacle that is Bush’s fault. HUH? That is correct, the recent GSA $823,000 tax payer waste of money during the Obama Administration is blaming George W. Bush with their constant convoluted circular logic of the Obama White House. I guess the making of the VIDEO by a GSA employee was Bush’s fault as well? The Obama administration is responding to the recent report that shows a federal agency spent more that $800,000 on a lavish conference near Las Vegas by putting some of the blame on the Bush administration. “At least we have taken, bold, swift forceful action to hold those responsible accountable and put in place protections to make sure this never happened again,” a White House official told Fox News. The administration also argued Friday night that the cost of the Western Regional Conference increased sharply under the Bush White House — from $93,000 in 2004 to $323,855 in 2006 to $655,025 in 2008, then $840,616 in 2010, or just 28 percent under Obama. However, on Saturday morning Emily Miller, a former GSA regional administrator for President Bush, suggested to Fox News that the Obama administration is spinning the numbers. 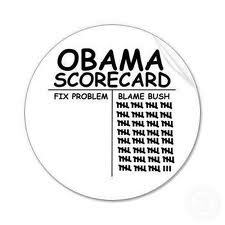 However, this blame game by Barack Obama is getting really old. Blaming others and not fixing the problem is hardly leadership. Blaming others for the problem and then escalating the problem is really not leadership. As stated by the Lonely Conservative, “And if it was bad under Bush, why is it alright that it got much worse under Obama?” BINGO!!! Can’t we say the same for government spending and everything else that Obama blames on Bush? The One took a bad situation and made it worse. Leadership indeed. The point of leadership is not to blame why you are in the position you presently are, but to inspire and provide a vision that leads one away from the bad place to a more productive one. I think we can see why so many had issues with Obama in 2008 as a community agitator’s skills are hardly that of a leader. True leadership is the quality to inspire others [team members, co-workers] into higher levels of teamwork, communication and vision. Leadership is the ability for an individual to influence others to accomplish an objective and directs the organization [country] in a way that makes a more cohesive process and to achieve a common goal. Good leaders do this for the benefit of the whole, not just to attain their agenda. The American people do not elect a President to blame others for their what they inherited. After all, what president has not inherited negatives from a previous administration? “We the People” look for answers, solutions and a reversal of fortune, not a President playing the blame game. As stated by Macsmind, when is Obama ever going to take responsibilityfor anything he does or does not do? Obama has yet to take responsibility for anything. At this point his legacy as the “Not Me” President is solid as a rock. What a gutless, coreless punk. Remember that when voting in 2012.
typical childish obama propaganda. the boy has never reached puberty.